The Reichstag Building is a symbol. At first blush, this classic structure seems like many others across the globe. But the Reichstag is a symbol of the German nation for reasons beyond the fact that it is the current seat of the German Federal Parliament. A devastating fire in 1933, which was believed to have been started by Communists, had the effect of solidifying Hitler’s dictatorial position. The building suffered further damage during WWII and was captured by the Soviet army. In divided Berlin, the partially reconstructed but much battered Reischtag was situated just to the west of the Berlin Wall. After the unification of Germany, it was decided that the building’s singular history should be accentuated, not covered up. With this in mind, architect Norman Foster oversaw a complete reconstruction of the building. Its signature piece is Foster’s spectacular glass dome. 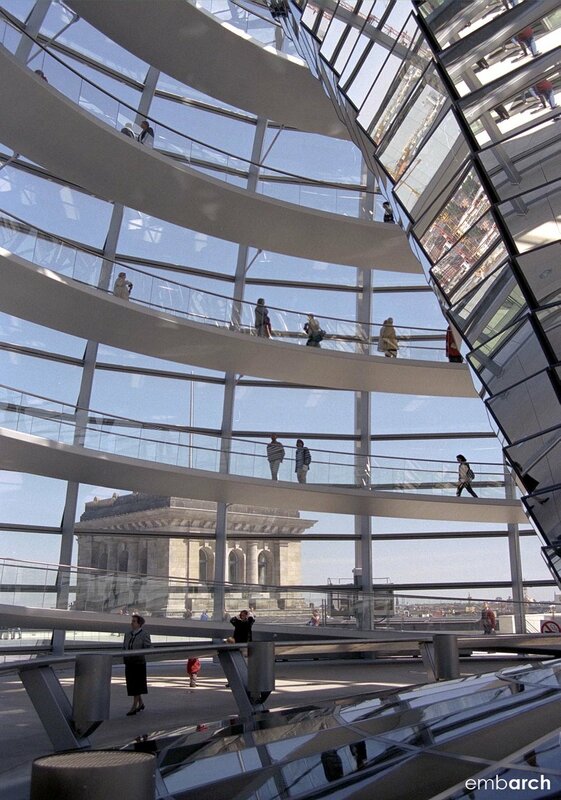 The dome’s transparency, and the use of a reflective mirrored cylinder within, signal the return to German democracy.